Sea Palling is off the main tourist trail being at almost the far eastern extremity of the North Norfolk coast. 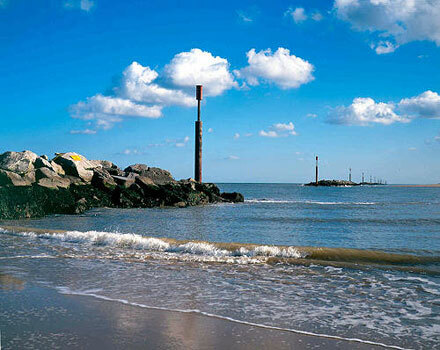 Facilities for visitors are few and far between on this piece of the coast but there is one important thing about Sea Palling that should not be overlooked; this tiny seaside village has one of the finest sandy beaches in the whole of North Norfolk. 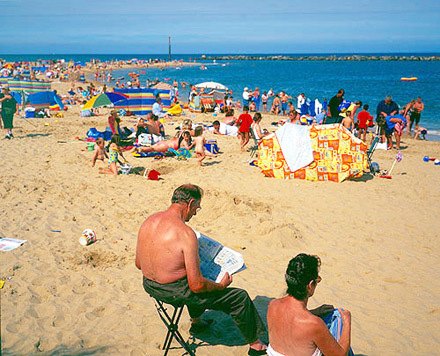 This popular beach is partly man-made as most of the sand has built up as a result of the extensive sea defence works that were completed just a few years ago. Sea Palling is worthy of such protection because it is a natural ingress point for flood waters if there were another North Sea surge, such as that last seen in the catastrophic North Sea floods of 1953. Because of its topography Sea Palling would act as a giant funnel allowing flood waters to make their way into the precious Norfolk Broads National Park. This would cause extensive river flooding and untold damage as far inland as Norwich. When visiting Sea Palling it is worth walking west along the narrow road that runs just on the land side of the sand dunes. Over many years along the side of this road an unofficial development of holiday dwellings of all shapes and sizes has grown. Some are like ordinary beach huts but others are far more ambitious and unique in design. Sea Palling has a public house called the Old Hall Inn (reputedly haunted) beside the main coast road, and The Reef Bar provides food and drink down by the beach car parks. That lead photo is beautiful. I don’t think I’ve ever been to Sea Palling but it looks lovely.